Operating a business online requires a certain level of security to ensure that your website is protected against hackers and cybercriminals. Regardless of the size of your business online, any website left unprotected is susceptible to cyber threats and a vulnerable to a full-scale cyber-attack. Cleaning up the mess and getting your site back up and running can costs you thousands of pounds. Not to mention, the shot your brand’s reputation would take from the backlash could be detrimental. Customers would lose their confidence in your business and if you’ve been collecting financial data, you could face possible lawsuits. It is your number one priority and responsibility as a business owner to ensure that your user data remains confidential and your website has the best line of defence against any breach. When it comes to having layers of security for your website, having a firewall is an excellent starting point. Firewalls come in various forms, it can be an actual hardware device, software, or a cloud-based format. A firewall’s main task is to scan incoming data for malicious content. If it finds anomalies or threats, it filters it out, blocks it and only allows vetted data to pass through to your server. Your website needs virus protection, malware protection and a reinforced safety net that keeps malignant hackers and cybercriminals out. When setting up your hosting service with a hosting provider, security tools should be high on your discussion list, and you want to ensure you use the best. 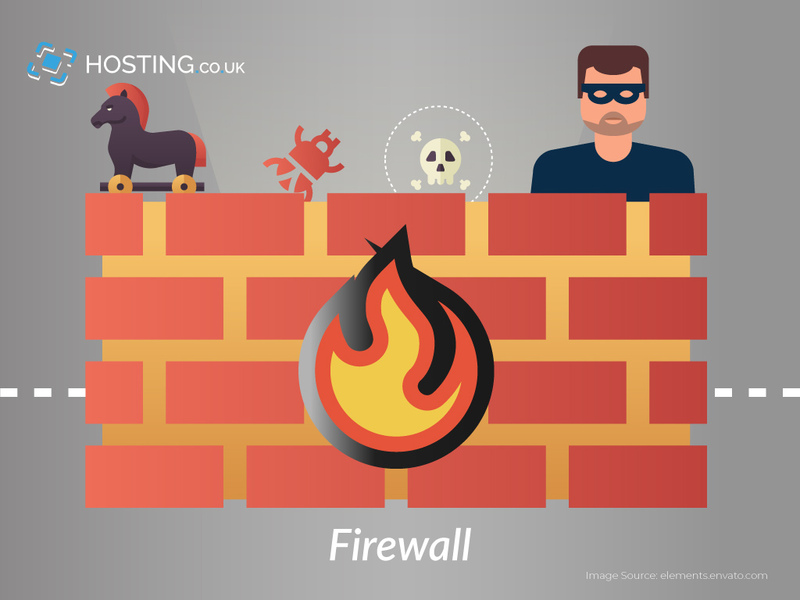 In this article, we are going to outline why you need a firewall for your website’s security detail, emerging trends with firewalls and more importantly how they work in detail. On a basic protection level, there are four types of firewalls that exist. They are: network level, application level, stateful multilayer and circuit level. Firewalls should be used as part of the overall security detail that includes application integrity, data integrity and confidentiality, and authentication. They are vital due to their function—they prevent malicious software, malware, and unwanted pieces of data from infiltrating your network. Firewalls, in a nutshell, ensure a secure database and extended virus protection. This is imperative because even one hole could be enough of a security risk that makes the entire network vulnerable. Firewalls operate at the network layer allowing them to recognize all incoming requests to the server passed on their IP (internet protocol) address. Your ISP (internet service provider) duty is to assign unique IP addresses to each website user. With a firewall you have complete control over the access controls at set up; you have a choice between starting with open access and closed access. Open access allows all external IP addresses to send traffic to your server’s network with the exception of IPs specifically blocked. Closed access is the exact opposite, only allowing traffic from IP addresses that you gave explicit permission. With a small yet growing business online, you will, of course, enable open access to your website so that as many users can browse it and convert to potential customers. The problem here is that back-end servers managing your site and related applications should have stricter controls. Therefore, when setting up firewall policies ensure you give restricted access first as a security measure. The internet has evolved beyond using physical servers in company offices to house data to cloud services where data can be safely stored in a virtual space. This helps to cut costs and eliminating physical losses. However, with cloud spaces, your data is housed in a shared virtual environment and this can still present a risk. That is why it is imperative that strict firewall safety is used even with cloud services. Cloud service, is a great financial investment but your data can still be exposed to hackers. Speak with your hosting provider and discuss the various firewall services available for your cloud-based data storage. Back-end database systems run all websites and mobile applications so users can interact with the display of front-end interfaces. For this reason, it is imperative that adequate security measures are in place. If your small business or enterprise has a website with a mailing list opt-in form, then each user that submits online has their request sent from browser to the mailing form’s database. This communication between databases, if not secure, can be a security risk. How do ensure back-end databases are secured? By using a firewall as a means of providing a securities intermediary. Your server needs to communicate with the database in order to add and retrieve new or old records. However, that does translate to external users and systems having direct access to that data. If so, it could pose a potential security loophole that hackers could exploit. Best practice is to use a firewall configuration that only allows internal IP addresses from vetted application web servers to connect to the ports of the server’s database server. Block all other connections. By doing this you ensure a high-security level with minimal breach potential. While firewalls work as great network sieve filters, one of the other advantageous functions is detecting and blocking malicious packet requests in the form of viruses and malware. Firewalls are highly effective against thwarting these types of cyber-attacks. However updating them with the latest anti-virus is key to ensuring their continued effectiveness. What’s more, adding a firewall to your emailing system protects against malignant files and helps to prevent phishing attempts. It is also well to note that you want to ensure that your website has an adequate back-up service employed to safeguard against data loss that can result from cyber-attacks. Every layer of security is a crucial necessity. We’ve discussed the usefulness of using firewalls to protect your cyber network and servers. In the same breath, you also need to protect the hardware devices in your offices. Hackers will exploit any weak spots they can find. In fact, they won’t hesitate to infect your computer with backdoor viruses. This can lead to an open door into your network. Cybercriminals will infiltrate your business via your computer, local Ethernet and wireless connections to get at your company data and the financial records of your users. To mitigate and prevent this your hardware system needs to use a trusted firewall at the software level. All computers that connect through the internet at your offices should have a firewall installed and modems and wireless routers should have one as well. Top-notch hosting providers ensure that they offer a plethora of internet security options with their hosting solutions. When considering hosting ask questions about what options are available for internet security and firewalls. With managed hosting solutions like shared web hosting, firewall protection is typically provided by the host. Discussing the extent of this protection with tech support can answer any questions you may have and help you make the decisions to add other valuable tools like website monitoring. If you are looking to upgrade your current hosting environment and are considering VPS or dedicated server hosting your options are much more flexible in terms of the type of firewall you can opt to have installed on your servers. The bottom line is that firewalls are a security necessity. As a small business enterprise, you must protect the confidentiality of your users and the financial data of your customers. You also need to secure your online business to prevent loss of data, reputation and brand damage, and more importantly, preventing incurring high costs in data and website recovery in the event that a cybercriminal breach or exploits a security vulnerability. Your website security force needs a firewall. Discuss your options with your hosting provider. It is always important to ensure the internet remains a safe place for your users and your brand.